I fell in love with Floyd county on my first visit. It has a lot of scenic vistas, but it is the people that made me feel that I had finally arrived where I was meant to be. There is a hospitality here that I have not found elsewhere. There is also a creative spirit here that inspires one to join in and do things that don’t seem possible elsewhere. Talent is encouraged, rather than stifled. Hard work is also encouraged and one finds many talented people holding several jobs and still managing to create with music, clay, fiber, or paints. There is an attitude here that it is OK to major in Art or to work instead of going to college, or to move to Alaska and homestead, or to spend a year volunteering in Africa. Success for most is not measured by high paying jobs and extravagant lifestyles. There are some here who enjoy both, but you would not know it by their dress or by their speech. This is supposedly one of the fifty poorest counties in the US, but it has a richness of spirit and a bounty of creative ideas that more pro$perou$ locales might envy. This creativity attracts still more creative people who want to contribute to the motion. The lack of jobs and local industry seem to stimulate the ingenuity of those who see in Floyd the answers they have been seeking. They come and create small businesses and in the process they enrich the county with new ideas and new services. Not all share in the bounty, but grumblers who resist change are to be found everywhere. In Floyd County, the grumblers can be heard if you listen hard enough, but their influence diminishes every year. The people with positive ideas who are willing to work for the good of the county seem to be growing in numbers. I meet more of them every month. As I said at the beginning, Floyd Virginia is a county full of good ideas. They even encouraged me to hang my photo of the Blue Ridge Parkway in the Chamber of Commerce office. I am happy to contribute to the Floyd community and there were no barriers to my participation. More localities could benefit from this approach. 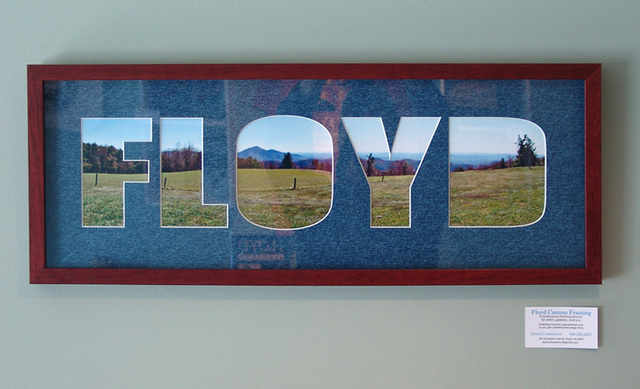 This entry was posted in Blue Ridge Parkway, Country Living and tagged Blue Ridge Parkway, Floyd Chamber of Commerce, Floyd Custom Framing, Floyd Virginia, lack of jobs. Bookmark the permalink. my husband and i look forward to visiting when we make it up the east coast to DC and virginia. we want to see this place we read about and meet some of the people who make floyd sometimes seem magical!